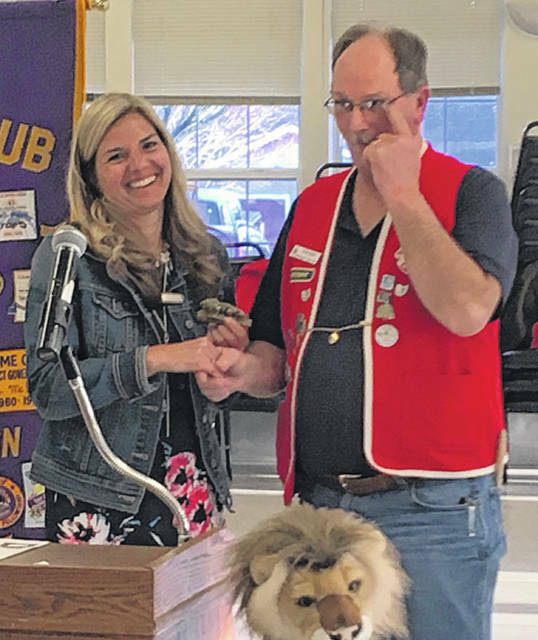 At the Monday night Lions Club meeting, Carrie Zeigler is given a Lions statuette by Club President Lion John Hibbs. Carrie talked about the Sleep in Heavenly Peace organization and how it provides twin-sized bunk beds for local children who don’t have beds to sleep in; many often sleep on the floor. The Clinton County chapter has recently been added to the nationwide group of 127 chapters in 39 states. The club was asked to help support this project which continuously becomes aware of more and more children needing their help. In addition to the bed frames, mattresses and bedding are also provided for each child.